It’s coming back down successfully that’s the hard part! Anybody who knows me knows that I’m a devout fan of high-power amateur rocketry. It’s an exciting hobby where ordinary men and women launch huge rockets to amazing altitudes. At launch events you’ll frequently hear the old-timers say something like, “The ‘up’ part is easy. It’s coming back down successfully that’s the hard part!” This saying was born of the fact that although most rockets will actually achieve some altitude, many of them will never return to Earth in one piece. Instead, due to some failure in design or construction, they end up smashing violently into the ground rather than floating down to their intended gentle landing. I got to thinking recently how this axiom is true with article marketing as well. Getting your articles up on the Internet is the easy part. You need only become an EzineArticles member, write articles that adhere to the EzineArticles Editorial Guidelines and submit them. In a matter of days, they’re up on the web. Getting traffic and sales to come back down from those articles is a whole lot tougher. There are myriad factors that can influence whether an article reaches great heights of success or simply crashes and burns… delivering zero traffic or sales in the process. So let’s follow the flight of an article’s performance from launch to recovery to see where many failures can occur and how to prevent them. Utilize Tracking – In high-power rocketry we use electronic tracking devices to help find our rockets after they’ve drifted miles away. In the same way, you want to keep track of your site visitors and customers so they don’t simply “drift away”. Wherever possible, harvest visitor and customer information, at the very least email addresses, so that you can maintain contact with these people. And utilize the tools available to you in your monthly Article Performance Reports to gain a better understanding of what works… and what doesn’t. If you’ve done everything right, your percentage of successful article flights should be fairly high. But just like high-power rocketry, sometimes things just don’t work as planned and your article ends up failing dramatically. When this happens, pick up the pieces, investigate the reason for the failure and learn from your mistakes. The best teacher is experience… which, in the case of article marketing, means write, write, write (and submit, submit, submit). Metaphors like this one are an excellent way to help us understand complex processes. What other similarities can you find between rocketry and article marketing? Share them with the rest of us by leaving a comment. Funny metaphor. I like the “soft landing part”. Most people forget that there should also be a good and soft landing. The landing phase starts with well written resource box that should link to the web page where the reader finds exactly what he looks for without having to look around any further. So, in most cases, don’t link to your homepage but to a web page that correlates with the offer in your article. A perfect example is this: When your article resource box offers a free guide to download, then the link should exactly go to the download page. When your resource box talks about a special discount for a certain product then the link should bring him exactly to the special offer page etc. Many make the mistake to send the customer to the homepage where the reader can’t find what was promised in the resource box. If they don’t find what they want within 3 seconds then they will leave. What I noticed is that SEO-Related topics are viewed the most..
Well it’s a sort of metaphor..
Just as one would enjoy the ride, were one to man this rocket, (speaking for some, other than myself), one must remember to enjoy the ride from both perpectives, both up and down, for in this way we become complete. Without a contrast, one never knows how to be grateful! The one who wants to write for monetary gain alone, is missing the real benefit of giving of the true cache one possesses! Your Metaphor caught my attention because I use to launch model rockets also. What ever gets your readers attention is good. You need good content to keep them interested, but getting their attention is half the battle. Enjoyed the article. I have some sort of experience in articles writing. I like your post and i would like to add that the more precise and direct meanings you convey the same will be the chance of your article popularity. A rocket or an airplane can be seen by more people only as they climb higher – higher than the dense trees and concrete jungle around them. Similarly, your product offerings will get noticed more as they gain in height in terms of article quality, quantity and smartness (SEO etc.). Throughout the process, you need to chip away at the stone. It is bound to give way. Thanks for the inspirational metaphor. I sure now have a new perspective on Article Marketing strategies. Fantastic summary. And I love the easy 1, 2, 3, etc. steps to follow. Article marketing success is about looking at each step and trying to constantly improve upon each one over time. But true success in article marketing–indeed, life itself–is about not dwelling on those past things, but learning from them to improve oneself in the future. Maybe as a separate or side pledge to the HAHD challenge, people should pledge to constantly work on and improve each element of the 6 steps outlined above. I think it really helps to compartmentalize article marketing into the distinct steps you just did and focus on improving each element as a separate entity that ultimately combines to form a higher quality unified whole. Have a launch schedule: in rockets or articles, don’t launch them all at once – you will crowd the skies – or cyberspace and not have a chance to track the trajectory of each launch and learn from successes and failures. Timing is important. Thank you. I learn something here. Great points in this post for sure! 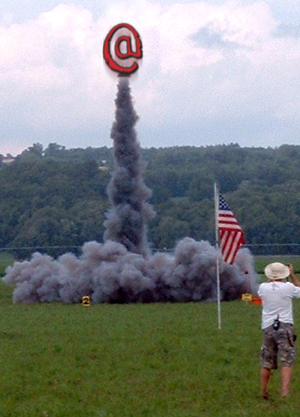 Also, I enjoy rocketry as well so the metaphor was fun.